Promulgated by the International Chamber of Commerce, Incoterms are the set of international standards for the uniform interpretation of common contract clauses in international trade. Incoterms® 2010, comprises the latest revisions and should now be used exclusively. Incoterms® stands for “International Commercial Terms” and are internationally recognized terms of agreement for buying and selling goods across the globe. Incoterms® are agreed upon between the seller and buyer in regards to when the risk and responsibility of the goods and transport are transferred. Incoterms® are not law nor binding. They are only used as a guidance guide and represent different ways international shipments are bought and sold. When buying goods or importing into the United States, we recommend E or F Terms. When selling goods or exporting out of the United States, we recommend C Terms. 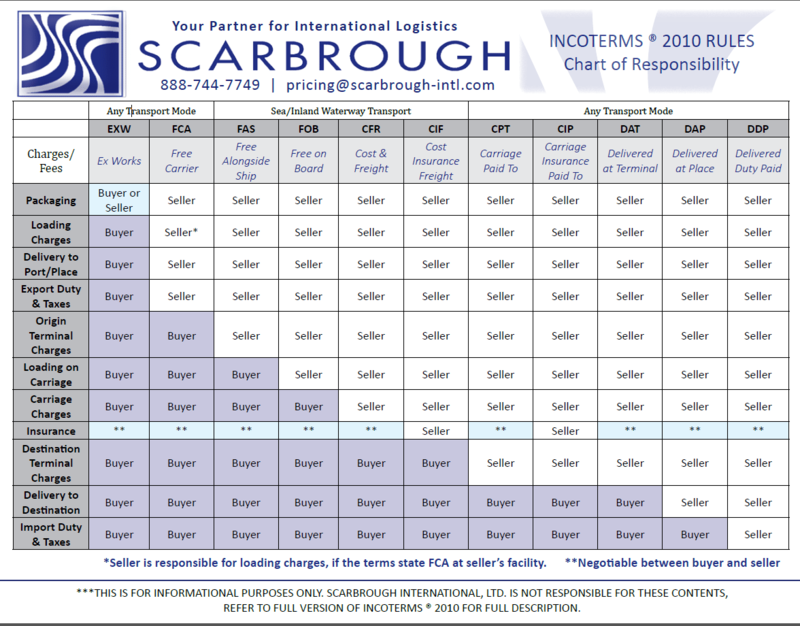 To request a cardstock hard copy or talk to someone about your Incoterms®, please email our team at insidesales@scarbrough-intl.com.